Choose from Traditional Bridge Table Covers and Designer Bridge Table Covers with unique card suits designs. All our covers are in stock for fast shipment. 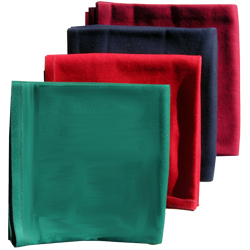 Our Bridge Table Covers are made of 80% Wool and 20% Nylon and come in three different colors including Jade, Navy Blue and Maroon. These Bridge Table Covers have no black trim or border and measure 48" x 48" square. These beautiful Jade Green Bridge Table Covers measure 48" side-to-side and feature four different card suit designs. Our Designer Bridge Table Covers are made of high quality fabric - 80% wool and 20% nylon, and the covers are hand-stitched for superior durability. For additional information or wholesale pricing on our Bridge Table Covers, please contact us at 1-800-233-0828. Feel free to browse our selection of Bridge Tables and Chairs or our Bridge Supplies and Accessories.